Annual MyLeave Certification Required for All Staff Who Submit Timesheets in MyLeave – SEHD Impact! On the CU Resources page (this may be your home page), click on the CU Resources drop-down menu at the top center of the page and select My Info and Pay. 3. 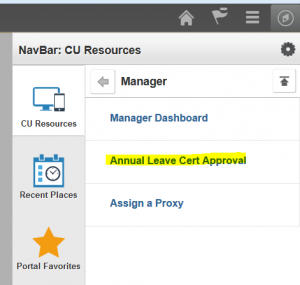 Then click on the Annual Leave Certification tile. Confirm that the Ending Balances listed match what is in MyLeave (use July’s Usable Balance Column to cross-reference) and then click on the “I agree with the Certification & OT eligibility statements” before hitting Submit. Supervisors will receive an automated email from the system with a notification that a supervisee has an Annual Leave Report that needs approval. Select Submit/Save, and you’re set! Microsoft Team Training Available for Staff on Monday, July 30 from 8:00-10:00a.m.